This year, Parks Canada offered free admission to parks across the country to commemorate Canada 150. As visitors flocked to take advantage of the opportunity, however, there was not much reflection in the media about the process through which national parks are determined and operated. 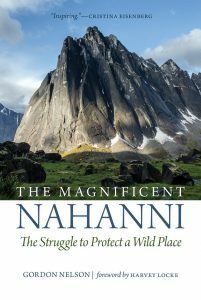 In his recent book The Magnificent Nahanni: The Struggle to Protect a Wild Place, Gordon Nelson looks at the process through which Nahanni National Park Reserve was established in 1972. The park, which is over 30,000 square kilometres, is in western Northwest Territories in the Dehcho region, with its western boundary edging to the Yukon border. In addition to its natural beauty, the park also includes an old mine and has been designated as a UNESCO World Heritage Site. In this episode of the History Slam, I talk with Gordon Nelson about The Magnificent Nahanni. We talk about his geography background, the physical landscape in the North, and the process of establishing a national park. We also discuss Indigenous communities in the North, their involvement in the process, and the traditional ways in which the land has been used. We conclude by talking about Canadians’ affinity for natural landscapes and whether we do enough to protect those landscapes. Any history of National Parks will be incomplete without further reflection on the plight of WWI internees who worked in them. https://www.youtube.com/watch?v=DDZ4HnX–hg. It’s well worth attending a screening with the film makers present.